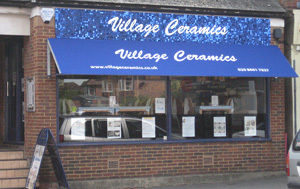 We invite queries via email (enquiries@villageceramics.co.uk), but please remember we may have a busy studio and it may take a little longer to respond! We are an extremely busy studio and it is essential to book places in advance. This is to ensure that your experience is an enjoyable, stress free visit, which is organised and well staffed. We ask for a non refundable deposit of £6 per painter in advance (this is your session fee paid in advance-so all you will need to pay for on the day is your piece that you choose).